One of the powers of TeamSupport is that we track a great deal of information about your customers. The Customer Distress Index, or CDI for short, computes a single number for each of your customers which will give you an idea of how often your customers are interacting with your support department and how quickly their issues are being resolved. This can be an important metric to understand how much difficulty your customers are having with your product or service. The CDI computes multiple individual metrics for each of your customers, and compares them with the averages of all of your customers. It’s important to understand that the CDI doesn’t measure absolute numbers, but instead it is looking at how much above or below the average of all of your customers a particular number is. The CDI data is displayed in the Customer section via a gauge indicator. A higher CDI number indicates a higher potential for distress. The calculated rating is displayed in the middle of the gauge, and is also displayed if you hoover over the gauge. While the CDI number gives you a great indication as to the health of your customers, it is a static number and doesn’t give any indication of which way the CDI is moving. To address this, we have added the CDI Trend Indicator. 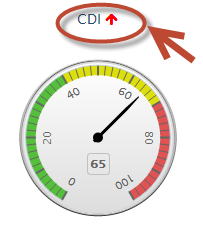 The CDI Trend Indicator is a red arrow pointing up, or a green arrow pointing down above the CDI gauge. When the CDI computations are run, TeamSupport also looks at the average CDI of the past 10 days for that customer and then displays an arrow indicating which way the CDI is moving. A red arrow pointing up indicates that the CDI is trending higher (not a good thing), and conversely a green arrow pointing down shows that the CDI is moving in the right direction. Please note that since the trend is based on the prior 10 days of CDI data, the trending information may not be accurate for new accounts or if the CDI Weights have been recently changed. Understanding which direction the CDI is moving for a given customer is critically important data and will help you understand and spot potential issues before they become large problems. 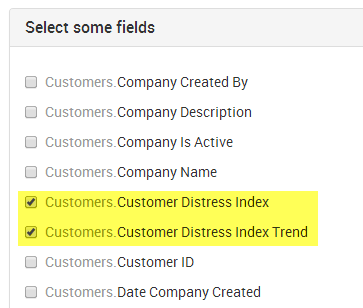 Reporting: In the Customers table, you can access the CDI data via the Customers.Customer Distress Index and Customers.Customer Distress Index Trend fields. The Trend number will be a -1 (good – trending down), 0 (no change over the last 10 days) and 1 (bad – trending upwards). The CDI number will be a value 0-100; the same as is displayed in the Gauge. Custom CDI Ticket Widget: A popular Ticket Widget utilizes CDI data to display on the ticket page. This makes the CDI data even more valuable to your everyday TeamSupport users. 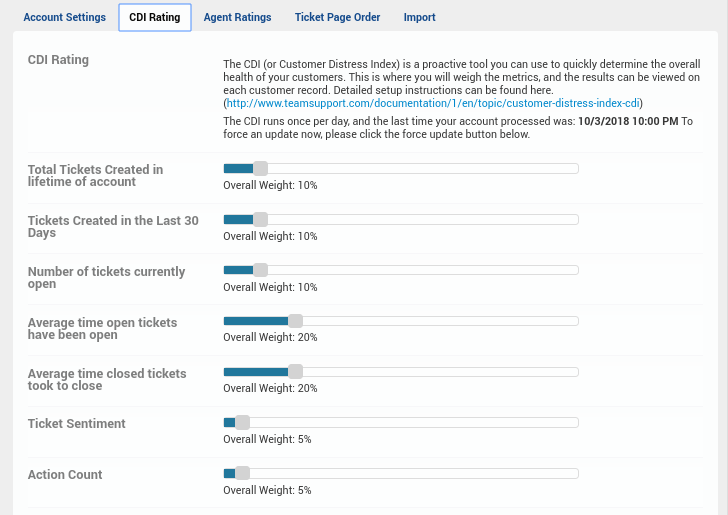 Ticket Automation : CDI Value and CDI Trend are available in Ticket Automation as a condition. This will allow you to take action if a Customer’s CDI value meets a certain threshold. For example, if a new ticket has a Customer association whose CDI is above 80, you can alert all users via a WaterCooler post. Ticket Types: Ticket Types are a core feature of TeamSupport and allow you to classify tickets in a structured manner. An option is provided for each Ticket Type which will excluded it from the CDI calculation. This may be necessary for Ticket Types that are not related to the satisfaction of your Customers, or skew the metrics (i.e. automatically generated tickets, internal tickets). To configure the CDI in your account, from the left hand navigation, select Admin->My Company->CDI Rating tab. CDI Rating: Contains a timestamp for the last time your CDI was processed. Your CDI is indexed once per day, but you can force update using the “Force CDI Update” button. Weights: There are multiple weights which you can configure. Force CDI Update button: This button will allow you to force your CDI to be indexed. The CDI is automatically indexed once per day. A forced index could take up to 30 minutes. Chart Green Upper Range: Indicates the upper limit that your CDI gauge will show as Green, or meaning low distress. Chart Yellow Upper Range: Indicates the upper limit that your CDI gauge will show as Yellow, or meaning moderate distress. This value must be equal to or greater than the Green Upper Range in order to save. There are multiple metrics that the CDI computation uses. They must all total to be exactly 100%. If you do not wish to include one or more of the weights in the calculation of the CDI, simply set to weight to 0%. Total Tickets Created in Lifetime of Account: The total number of tickets (that are both open and closed) which have been created over the lifetime of a given customer. This measures the total volume of interactions that a customer has had with your support team, and a high number here could indicate a customer who has needed a lot of help and handholding as compared to your other customers. Tickets Created in the Last 30 Days: This measures how active a customer has been recently and may be an early indicator of problems with a particular customer. This metric uses the tickets that have been created in the 30 days of most recent ticket data. Typically this means it will use the last 30 days from the current date, but may look back further (i.e. 30-60 days from the current date) if recent data is not available. Number of Tickets Currently Open: Measures the number of tickets which are open, wthout regards to how long they have been open. This is a measure of the backlog, and a high number here could indicate a customer who is frustrated with a lack of follow up and response from your support team. Average Time Open Tickets Have Been Open: This measures how “stale” tickets are by looking at the amount of time they have been open and not addressed. While this is related in many ways to the above metric (total number of tickets currently open), it differs in that it looks at how long they have been open and not the number of tickets. There is a direct correlation between how long a ticket has been open and the frustration level of your customers. Average Time Closed Tickets Took to Close: This metric will show if it has taken longer, on average, to address this customer’s tickets and could indicate frustration because of the lack of timeliness in resolving their issues. This metric uses the last 30 days of most recent ticket data. Typically this means it will use the last 30 days from the current date, but may look back further (i.e. 30-60 days from the current date) if recent data is not available. Ticket Sentiment: TeamSupport is leveraging IBM’s Watson technology to provide internal sentiment analysis on Ticket Actions. This metric uses a Customer sentiment score which is an aggregation of Ticket Sentiments associatied with the Customer for the last 3 years of available data. This CDI metric applies to Closed Tickets only. Action Count: A ticket can have any number of actions. It is reasonable to correlate that a higher action count indicates a higher ticket complexity and may lead to customer frustration. This CDI metric applies to Closed Tickets only and uses the last 30 days of most recent ticket data. Typically this means it will use the last 30 days from the current date, but may look back further (i.e. 30-60 days from the current date) if recent data is not available. Ticket Severity: Ticket Severity is an important field that is used throughout TeamSupport. We use a comprehensive list of names to issue a rank to the Ticket Severities. For example, 1 corresponds to Urgent emergency/outage, 2 Major, 3 Normal, 4 Low, 5 Very Low, 6 No Severity. These ranks (1-6) are used in the calculation of the CDI where Tickets with a higher rank (1 being the highest rank) will raise the CDI score. This CDI metric applies to Closed Tickets only and uses the last 30 days of most recent ticket data. Typically this means it will use the last 30 days from the current date, but may look back further (i.e. 30-60 days from the current date) if recent data is not available. Agent Ratings: Through Agent Ratings, TeamSupport gives you the ability to create a customer feedback loop, which gives you valuable insight into the satisfaction of your customers. This CDI metric applies a score based on the ratings your Customer has left on their tickets: Good rating receives a score of 1, a Neutral rating receives a score of 0, and a Bad rating receives a score of -1. The sum of the scores for the last 3 years of data is used for this metric.